if Dollmaster Dorian is pulled, would he trigger deathrattles? Use this card to quickly get rid of your death knight! 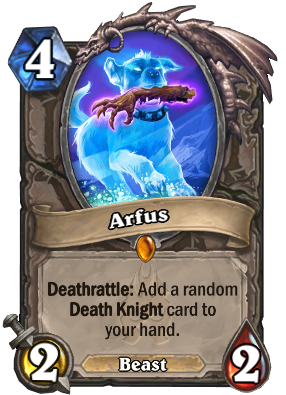 Best card ever in a big druid, playing Arfus just for this. I don't get it - what does it mean. Summon any minions removed. 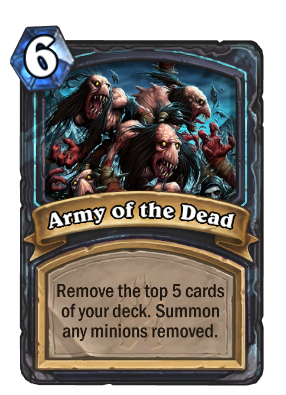 = since your 5 most powerful cards in your deck were removed, 5 cards now get played? So why when I played the card only 4 cards got played? Same as Varian Wrynn excepting you discard the spells. By top they don't mean the best, but the ones at the top of your deck stack. I don't think so because I think battlecry only works when you play the card. Does a golden version of this card actually play golden minions? After all we are Talking about removing cards (and replacing them?) - not drawing. Just asking, under the consideration of creating a golden Licht king. 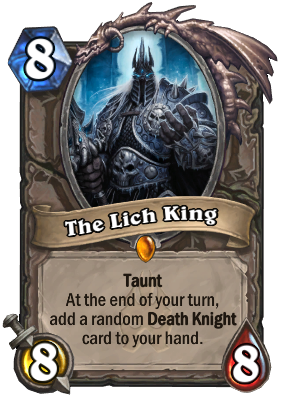 This is card of the reasons why I didn't insta-craft The Lich King. It's not as good as everyone says it is.